Iron Mountain Hot Springs is a featured geothermal attraction on the Colorado Historic Hot Springs Loop, a 750-mile drive that connects five premier Western Colorado hot springs destinations. The Colorado Historic Hot Springs Loop (CHHSL) is a scenic drive that takes visitors to some of the prettiest places in the state, all sharing one commonality — the opportunity for extraordinary hot springs experiences. Among the five Western Colorado towns included on the Loop, there are 19 separate hot springs amenities for visitors to explore, each one offering its own variation on the thermal soaking theme. Nestled on a bank of the Colorado River with mountain views all around, this Glenwood Springs hot spot is naturally conducive to blissful relaxation. Soothing music adds to the laid-back, spa vibe. When it’s time for a nibble the Sopris Café serves delicious meals, snacks and beverages including beer, wine and cocktails in pool-friendly packaging. A modern bathhouse features complimentary shower products and free lockers. Iron Mountain Hot Springs the perfect place to get started on the CHHSL with its central location in the middle of the state. Glenwood Springs is easy to get to via Colorado’s main east-west artery, Interstate-70. Iron Mountain Hot Springs’ 16 soaking pools and large freshwater family pool allow guests to test the waters and discover individual preferences. Most visitors like to try them all and find the one that suits them best. The pools at Iron Mountain Hot Springs range in temperature from 98°F to 108°F, an array that takes bathers from cozy to sizzling in increments. In addition to Iron Mountain Hot Springs, there are two other geothermal attractions in town. Glenwood Hot Springs Resort is known as the world’s largest hot springs pool. The Yampah Vapor Caves offers a steam-bath experience in a naturally-formed cavern setting. From historic and rustic to state-of-the-art spa facilities to cabin hideaways and natural creek soaking, the hot springs towns of Buena Vista, Nathrop and Salida offer diverse soaking experiences. The area’s geothermal springs include Mount Princeton Hot Springs, Cottonwood Hot Springs, Salida Hot Springs Aquatic Cabins, Creekside Hot Spring Cabins, Antero Hot Springs Cabins and Alpine Hot Springs Hideaway. Home to the world’s deepest geothermal aquifer, the Great Pagosa Hot Springs was discovered hundreds of years ago by the Southern Ute Indians. Today, it boasts three hot springs: The Springs Resort & Spa, Overlook Hot Springs and Healing Waters Hot Springs. These two towns are home to an eclectic mix of hot springs—from clothing optional and private hillside tubs to a large community pool and steam cave. Places to try in this neck of the woods include Orvis Hot Springs, Ouray Hot Springs Pool & Fitness Center, The Historic Wiesbaden Hot Springs & Spa, Box Canyon Lodge & Hot Springs and Twin Peaks Lodge & Hot Springs. An authentic western town with weekly rodeos in summertime and mountains of Champagne Powder™ in winter, Steamboat has two hot springs. Old Town Hot Springs is conveniently located in town; Strawberry Hot Springs is more secluded and becomes clothing optional after dark. 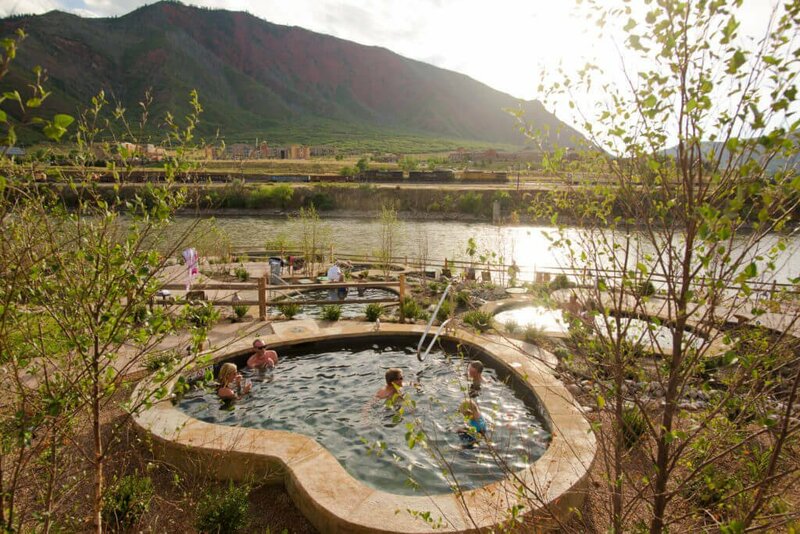 Begin your geothermal soaking adventure at Iron Mountain Hot Springs in Glenwood Springs then drive the Colorado Hot Springs Loop to try them all!